Mats has an extensive background working with well-known brands in the Food & Beverage, Hospitality and Retail sector for the last +20 years. Up until 1998 he was working in the tourism and hospitality business in various positions with special focus on environment, expansion and IT. 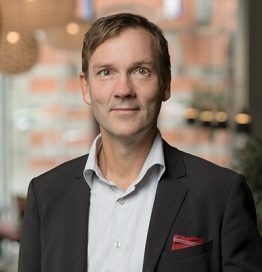 From 1998 until 2009 Mats worked at McDonald’s as a Real Estate Manager and Chief Controller before moving into the position of Director of Development, where he was part of the opening of the first McCafé in Sweden. After three years in the retail sector working with International Expansion at Axstores, Mats joined Wayne’s Coffee in 2013 as Deputy CEO. Over the latest five years, Wayne’s has transformed into a fast growing international company with a, more or less, unique position as a sustainability coffee shop chain – aiming to be the “No 1 organic Coffee shop”. Mats where appointed as CEO for Wayne’s from March 2018 when the company was sold by the founders to the German group Autobahn Tank und Rast.